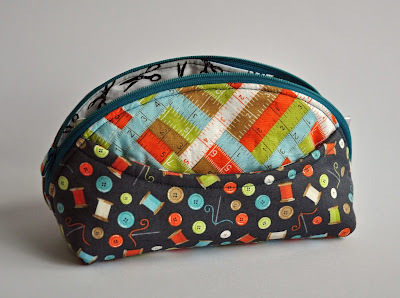 The pattern is the Tula Pink City Sampler. 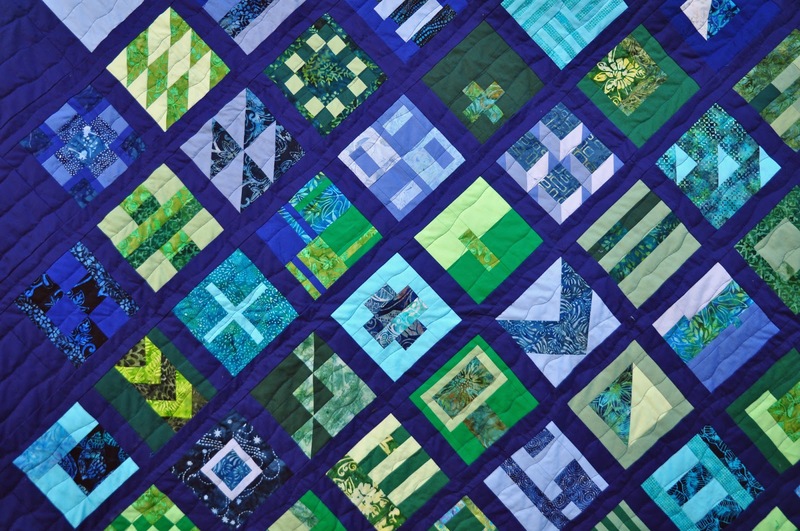 I made 85 of the 100 blocks from the book and decided on a layout that sets the blocks on point. 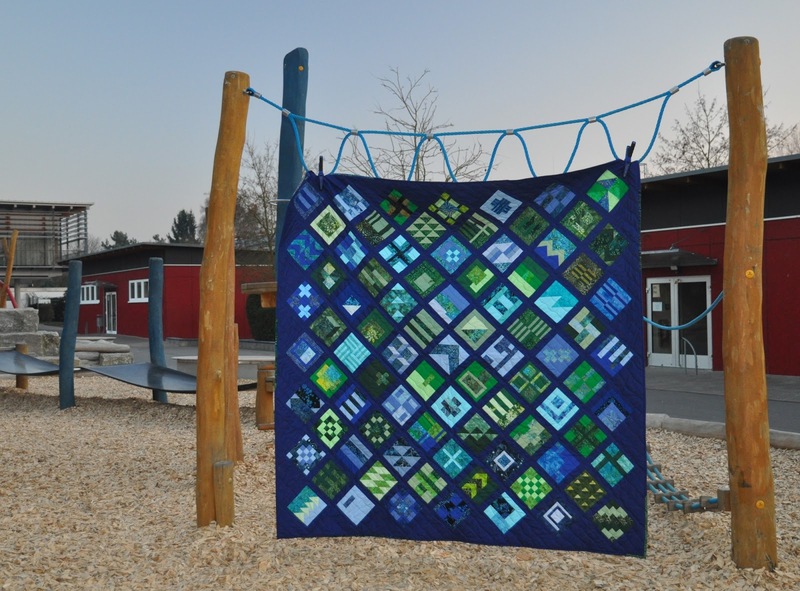 The quilt is 195 x 195cm (77 x 77 inches). 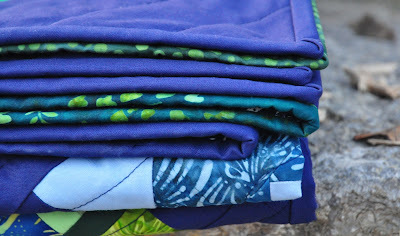 I started out with a fat quarter stack of blue and green Kona cotton solid fabrics, then added some more solids and lots and lots of blue and green batics. For the binding a used the same fabric as the background fabric (which is Kona Cotton in the color of Nightfall), with some extra batics thrown in. I already wrote about the difficuties I had in deciding on what to do with the actual quilting. In the end I did simple wavy lines using my walking foot. I was surprised that I didn't get any pucker, but for some reasons it just worked. I didn't even change directions between lines. 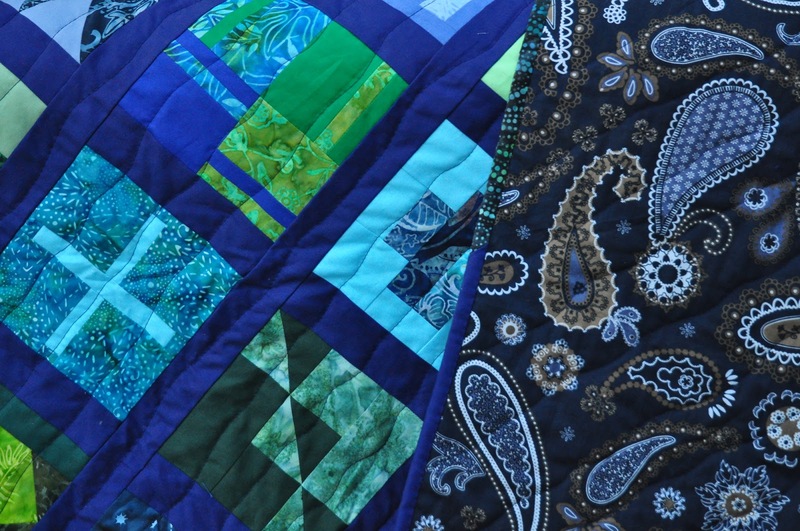 The quilting matches the quilt quite well, just enough to be there, not too much to take away from the pattern. Backside is the fabric from a quilt cover I bought at the Swedish furniture store. Big advantage, as there is no piecing involved from my side. I admit I had some reservations in between, if my color choice was a good one, but now, that everything is together, I think this is my favorite so far. 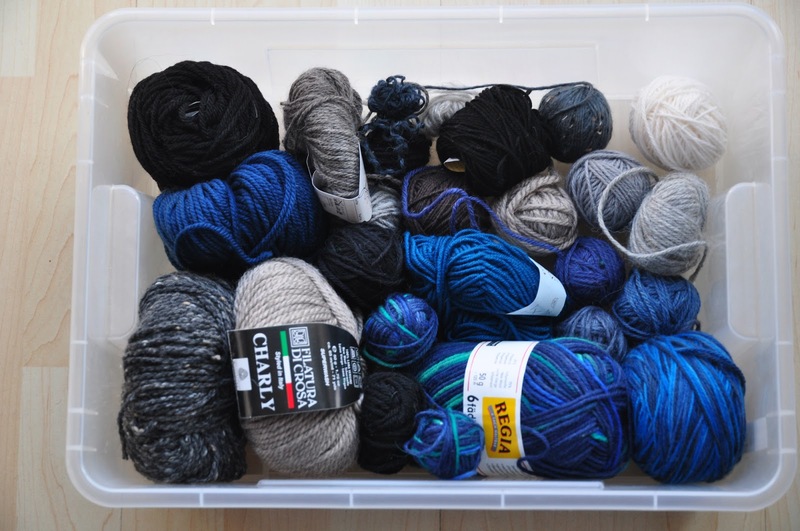 My plans for the weekend fell through, so I used the time to finally make an inventory of the yarn I own. 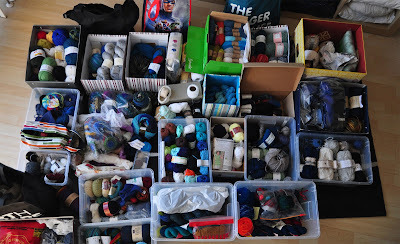 First I pulled out all the yarn I had in various places and put it in one big pile in the middle of the living room. I started to sort through the pile. I had a couple of givens. Whatever was in a shape that could for some reason or another be called useful, I checked against my stash list in Ravelry (got to love Ravelry), and if necessary, updated that list. 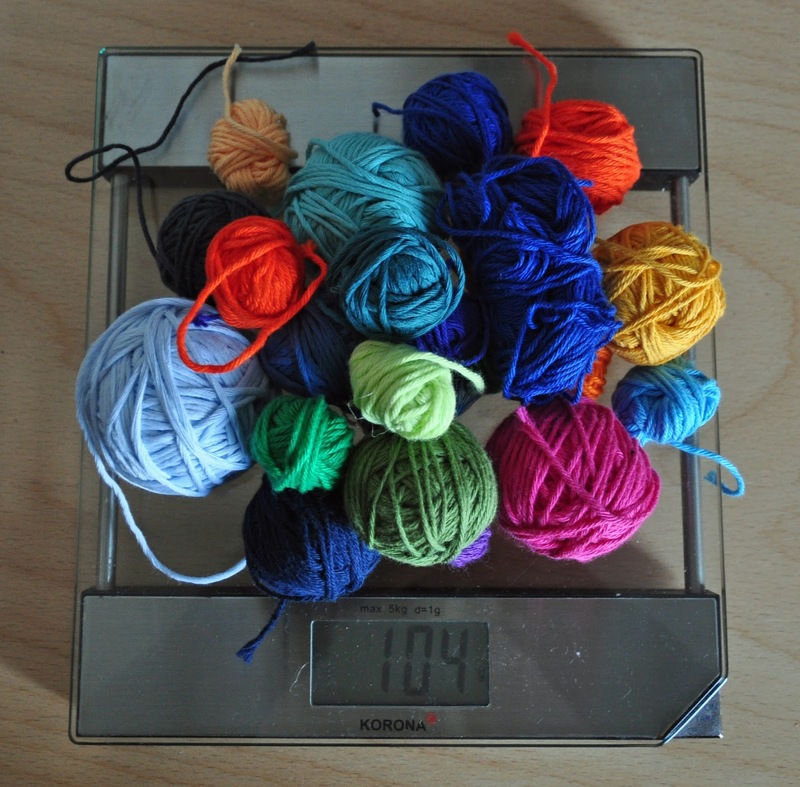 One of the great thing of Ravelry is that you can export the stash list to excel and play around with statistics there. 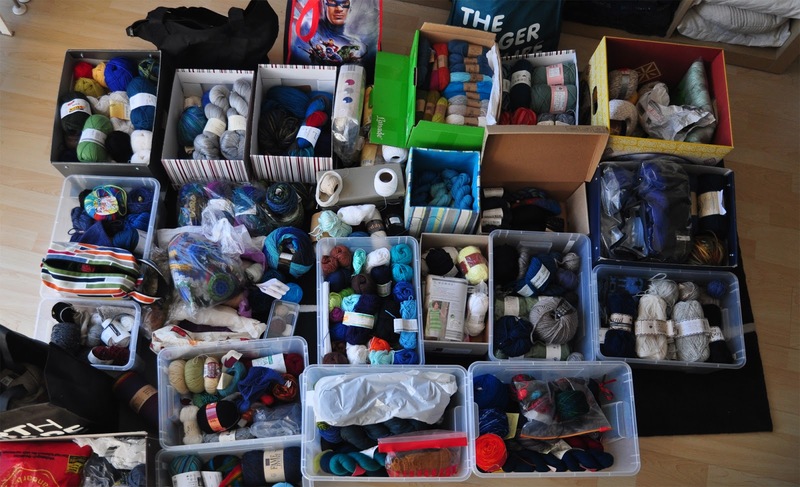 After registering most of my yarn now, I have 72,7 km of yarn in my stash. Biggest chunk in terms of meterage of that is Lace (17.9km), which is considering Lace is also the longest per weight, no big surprise. All in all I'm quite satisfied with the result of my inventory. I plan on making an afghan with the worsted yarn and then see if I can get rid of the some of the rest by donation. 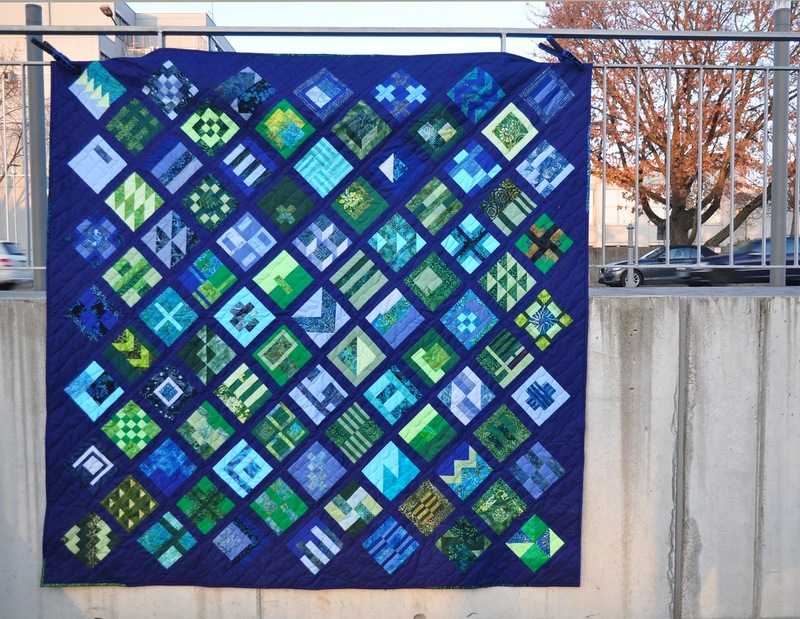 It took me three tries to finally get to a quilting pattern that I liked for the City Sampler Quilt. I unpicked what I have done so far, and started with a spiral/meander pattern. This one took longer to realize that this is not what I want. So it also took longer to unpick. But unpick I did. 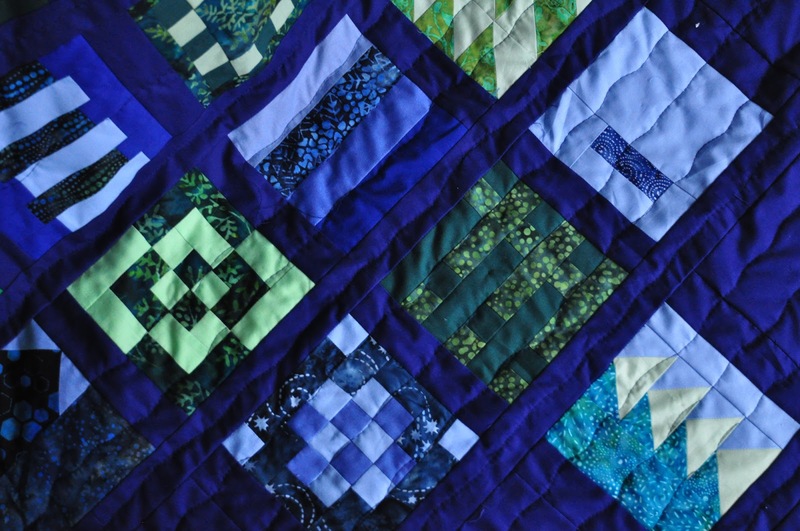 Finally, I just started to quilt in simple wavey lines about 2 inches apart using my walking foot. This one is much, much better. While the meanders distracted a lot from the block patterns, this one is much more in the background and works much better with the layouts. 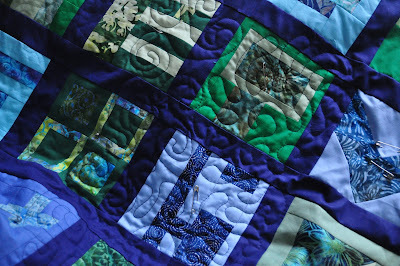 I've finished the quilting yesterday and have sewed on the binding today. 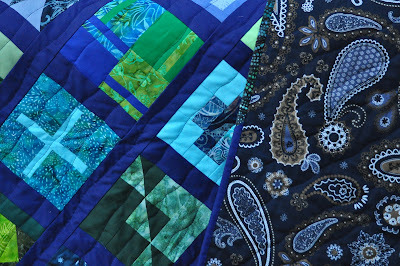 Only 7.8m of sewing by hand the binding over onto the backside of the quilt and then I'm done. This is a little bag I actually finished last year already. I bought the pattern at the Kreativ Welt Fair in Frankfurt in November. The fabrics were a gift at my birthday. The bag currently holds all my marker pens I'm using for quilting. I basted the Tula Pink City Sampler today. 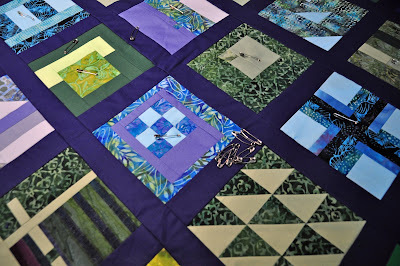 I used the same method I used for the Scrappy Trellis quilt, using clamps to hold the sandwich to the table while I put the pins in. I've found that this method works best for me (at least until I find something better). I have tried spray basting, but for some strange reasons I do prefer the pins, at least for the bigger quilts. 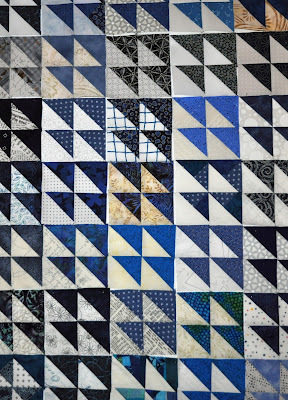 I then started free motion quilting, but after I've finished with the first bobbin (and 5 of the blocks) I decided I hate how the quilting looks, so I'm now unpicking. I got 42 blocks for me blue HST quilt done. 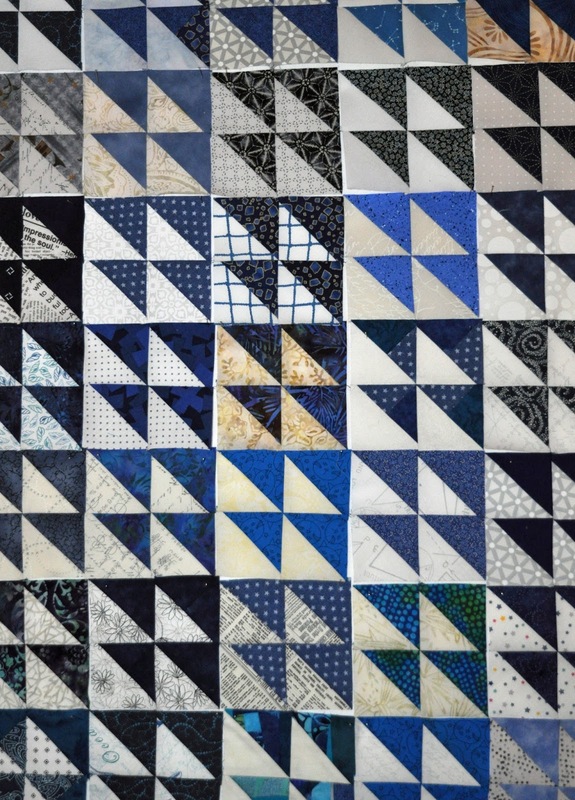 For a 60 x 70" quilt I need 168 blocks, so 25% are done. That is unless I'll go with a on point layout, then I may need a few more.